Data visualization has become more and more essential for companies over the past 20 years. Many Business Intelligence tools have sprung up, trying to answer this need. Among these tools, Tableau and Google Data Studio stand out, bringing powerful and easy-to-use solutions for reporting and data visualization. Beginners might think that Google is Google so their product is definitely going to be the best. However, anyone that has some experience in BI knows that Google Data Studio is a newer product, released only in 2016. In fact, Tableau has been the standard and the market leader for more than six years. 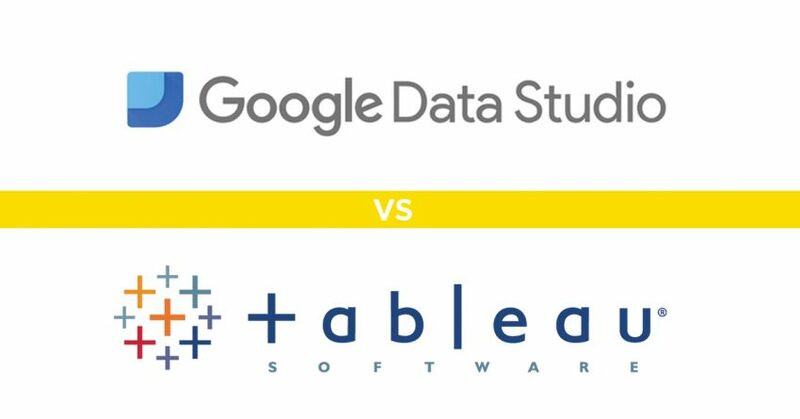 Let’s compare these two very powerful tools and explore the pros and cons of the ‘New Generation’ of BI tools (Google Data Studio) versus the ‘Old’ one (Tableau). Tableau is a desktop application in which you can make all the necessary manipulations and adjustments to your dashboard. In order to make these changes effective for your users, this dashboard needs to be published on the web along with the relevant data source. As a result, even the smallest change can be problematic and take a long time (users often prefer to accumulate a lot of small changes so that they can be synced all at once). In contrast, Google Data Studio is completely web-based and each change is saved instantly and automatically. Therefore, it’s very easy and fast to make any change on the dashboard. Sharing reports in Tableau with another Tableau user within the organization is relatively simple; once the dashboard is published, any user who has access to Tableau can see it. On the other hand, sharing it with an external client or user can be a much more complicated task. You can download data to PDF or to an Excel spreadsheet, but it’s not an ideal solution. Sharing reports on GDS is as simple as sharing a Google Doc or Sheet. One just needs to click on the “share” button and share it with any user that owns a Google account. Of course, as with other Google apps, there is the option to give editing or ‘view only’ permissions. When considering which tool suits your company best, pricing may be a very important factor. A Tableau user that can actually work on and edit reports starts from $70/month (for a single user). There are also other types of users that cost much less, like the “viewer” which is $12/month or the “explorer”, who can benefit from a few more functionalities, for $35/month. It is important to note that for the “viewer” option, you must purchase a minimum of 100 users, while for the “explorer” the minimum is 5 users. Conversely, Google Data Studio is completely free. You can create unlimited reports without having to pay anything, regardless if you have editing or viewing permissions. It is important to note, however, that if you store your data on Big Query (Google Cloud Database) and connect directly to Google Data Studio, you will be billed for each call of data according to your Big Query plan. Hosting is something that should definitely be taken into account when comparing Tableau and Google Data Studio. With Tableau, you need to be prepared to host the Tableau Server. In case you don’t have the infrastructure, then you can go for the Tableau-Hosted option, but it seems like it will be much more expensive. Tableau’s website does not specify the exact price, but they ask you to “contact our sales team” and usually this means that there will be significant extra charges. In Google Data Studio, you don’t need to worry about hosting at all. It looks exactly like a normal website and they don’t even mention the option of “self-hosting”. So far, we’ve talked a lot about the business side of these two great reporting tools, but let’s get a little more into the technical side and see what they have to offer there. Text Table (Crosstab), Heat Map, Highlight Table, Symbol Map, Filled Map, Pie Chart, Horizontal, Bar Chart, Stacked Bar Chart, Side-by-Side Bar Chart, Treemap, Circle View, Side-by-Side Circle View, Line Charts (Continuous & Discrete), Dual-Line Chart (Non-Synchronized), Area Charts (Continuous & Discrete), Scatter Plot, Histogram, Box-and-Whisker Plot, Gantt Chart, Bullet Graph, Packed Bubbles. Tables, Scorecards, Time series, Bar Charts, Pie Charts, Geo Maps, Line Charts, Area Charts, Scatter Charts, Pivot Tables and Bullet Charts. All of the above are very easy to create and edit by simply clicking on them. All the elements can be dragged anywhere on the page, made of any size and copy-pasted just by pressing CTRL-C and CTRL-V. Overall, charts and tables are easier to create on Google Data Studio by using drag and drop, but the platform still has some bugs and, sometimes, creating a simple chart and showing basic data on it can be problematic. Tableau, on the contrary, is very powerful and reliable, and you can be sure that you will create great views with this tool. Which data source is supported is a very important factor when considering which tool to go for. If you work with a database that is not supported in one of the platforms, then it might not be the right choice for you. Tableau can connect with a large number of data sources – the list is so long that it would be excessive to write it here. The tool is one of the market leaders and it has been in the market for over six years. Therefore, most of the connectors are supported so one should have no problem connecting their data source. Data for Data Studio is a little more tricky. The tool supports all the Google products (which are widely used) and a lot of “partner connectors” (this is how Google refers to them). These partner connectors are third-party platforms that contain data and can connect directly to Google Data Studio. The list of connectors does not contain any other database except for MySQL and PostgreSQL. Calculations on Tableau are extremely powerful. You can create pretty much any calculation that you can think of, regardless of whether the calculation involves a mixture of string, float or integer, or whether the data is aggregated or not. On Google Data Studio, calculations are pretty limited. You can create most basic calculations, but when you slightly increase the level of difficulty, the platform starts acting up and it is therefore better to take a step back and do these manipulations on the data source level (on your own database). Tableau has great options when talking about parameters. You can create parameters of all kinds and make your report 100% customizable and sophisticated. Google Data Studio unfortunately doesn’t offer this option. However, Google makes changes to the product on a weekly basis, and week after week it becomes more and more powerful. We might therefore see this feature in the near future. With a few workarounds, you can manage to create something that will look like a parameter through Data Studio’s calculations, but most of the time it is not powerful enough. On average, Tableau releases an update once a month. The process of updating Tableau, however, is not so trivial and could take several hours. Google Data Studio, rather, updates every week or two, and the changes are automatic. The biggest effort that needs to be done in order to benefit from changes and updates is to refresh the web page. Let’s talk about aesthetics. Which tool looks better? Tableau looks a little “old fashioned”. No matter how hard one tries to make a report look beautiful, there is always the sensation that it could look better. Dashboards on Tableau are composed of rectangular elements that have to be put together like a puzzle in order to create any view. You don’t really have the freedom to drag and drop whatever you want wherever you want. Data Studio is the exact opposite. It looks like a new generation tool and, with very little effort, you can create extremely beautiful reports. You can drag and drop anything wherever you want. You can also add external images that you can put as a background in order to make the dashboard look even better. Something that you cannot do on Tableau and that, in my opinion, helps a lot with the design is overlap elements and decide in which order they appear (bottom, top, middle). In conclusion, Google Data Studio is a much more user-friendly tool that reflects the needs of the new generation user. This great tool is easy to access, easy to edit and easy to share. It’s still not very strong when it comes to calculations and still has some bugs, but overall we can be optimistic because Google is constantly making changes to the product. We hope that, in the future, it will be close to being the perfect BI tool. Tableau, on the other hand, is a great “old generation” BI tool, extremely powerful but less user-friendly. It’s not so easy to make changes to reports and you need a dedicated person within the organization to maintain the platform. On Tableau, you can create very complicated calculations and parameters and make them appear in any dashboard very effectively. The platform barely has any bugs and it’s very strong and reliable. If you are a small organization that goes through changes very quickly, I would suggest going for Google Data Studio. In case you are part of a big organization with large budgets for the BI department, then Tableau is the tool you are looking for.